DaDa | CowParade Retired Figurines | One Price Low Flat Shipping! From the CowParade European Exclusives Collection, Dada. From the CowParade Sao Paulo 2005 exhibit, Dada. Designed by artist, Joao Armentaro. Made of hand-painted resin. Measures 4" x 6". 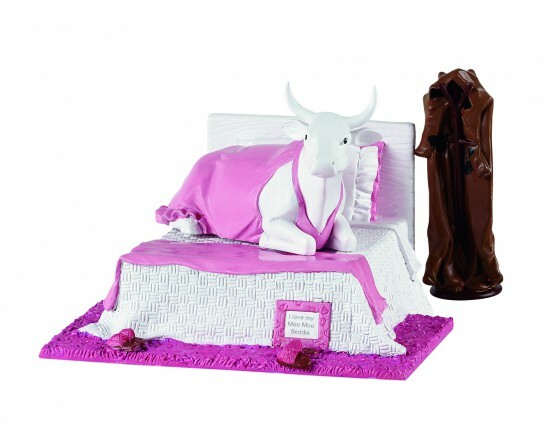 This hilarious diva cow figurine is dressed in a pink night jacket on a pink and white bed with her morning coat bedside. On the floor is a picture frame that says "I love my Moo Moo Beddie."